We see a lot of confusion around opportunity and action. In the 2018 Deloitte Global Human Capital Trends survey and report of business and HR leaders, 72% indicated that AI, robots, and automation are important — but only 31% felt their organizations were prepared to address strategy to implement these technologies. There aren’t that many AI-driven companies yet, and while we have seen a few examples outside of tech, most of the ones that do exist are technology companies. That makes it a little speculative to define the traits leaders need to help move their organizations to an AI-first future. Still, it’s useful to begin to develop a framework for what we already know about what it takes to be an AI-driven leader. They learn the technologies. It helps a lot in leading with AI to know what AI is and does. Yes, this sounds obvious, but by tradition, leaders outside of IT fields have rarely felt the need to understand technologies beyond the surface level. AI is different. It is not just one technology, but many — each with its own application types, stage of development, strengths, and limitations. Some, like robotic process automation, are relatively easy to implement — even for non-IT people — and provide rapid ROI. Others, like deep-learning neural networks, are much more complex and cutting-edge, requiring high levels of expertise. AI-driven organizations typically want to explore a wide variety of technologies, and leaders need to know enough about them to be able to weigh in on which ones will be most critical to their organization’s success. They establish clear business objectives. As with any other technology, it’s important to have clear objectives for using AI. Is there a service that could be easier for customers to use? Are there particular business processes in which knowledge isn’t effectively distributed? Are some types of decisions not employing data in the way they should? AI can address any of these issues, but probably not all at once, so leaders need to make some choices. The 2017 Deloitte State of Cognitive survey of U.S. executives with a high level of AI awareness and operating within the companies that are most aggressively adopting AI and cognitive technologies found that the most popular objectives involved using AI to improve existing products and services, make better decisions, create new products, and optimize business processes. Of course, there are choices that need to be made deeper within each of those categories. These decisions are appropriate for senior managers to own and make. They set an appropriate level of ambition. Some organizations have difficulties in pulling off highly ambitious goals, and “moon shots,” not surprisingly, don’t always reach the moon — and may set back AI initiatives overall if they fail. The alternative is to undertake a series of less ambitious projects — often called the low-hanging fruit. Even at Amazon, one of the most technologically sophisticated organizations in the world, CEO Jeff Bezos noted in his 2017 letter to Amazon shareholders that while the company is undertaking some highly ambitious projects like intelligent drones, the bulk of its machine learning efforts are devoted to “quietly but meaningfully improving core operations.” While less transformational individually, a series of such projects can add up to major change in a product or process. We generally feel that most companies will be better off with a series of less ambitious AI projects, although there may be some circumstances in which a large-scale goal is warranted. They look beyond pilots and proofs of concept. Our research suggests that AI projects thus far are heavily weighted toward pilots. But to improve productivity and achieve the needed ROI, leaders need to push their companies to scale up these projects to full production status. This means identifying process improvements before applying technology and figuring out how to integrate AI technologies with existing applications and IT architectures. These are not easy skills. AI-driven leaders must help to assess the potential for full-scale implementation before embarking upon pilot projects. They prepare people for the journey. Most AI projects will involve “augmentation” — smart people working in collaboration with smart machines — rather than large-scale automation. That means that employees will have to learn new skills and adopt new roles, which won’t happen overnight. Good leaders are already preparing their people for AI by developing training programs, recruiting for new skills when necessary, and integrating continuous learning into their models — and in fact, the 2018 Digital Business report by Deloitte and MIT Sloan Management Review shows that businesses are putting an increased focus on continuous learning. Bank of America’s Technology and Operations function developed a series of online education programs for its over 90,000 employees that addresses some of the skills needed for work alongside the bank’s chatbot “Erica” and other AI applications. Deloitte has focused on making its professionals “tech-savvy” — and not just those who work in tech consulting — with an understanding that in an AI-oriented business environment, virtually every Deloitte employee will need to understand how technology works and fits with their jobs. They get the necessary data. AI-driven leaders know that data is their most important asset if they want to do substantial work in AI. Leaders planning to use machine learning to predict what their customers will buy under what circumstances, for example, need high-quality data on what different types of customers have bought in the past. Leaders of health care organizations that want to use deep-learning models to analyze medical images need a lot of images with labeled outcomes from which the system can learn. Many organizations will need to turn to external data to augment their internal sources, while others will need to improve data quality and integration before they can use it with their AI projects. In other words, AI-driven leaders need to start now, if not yesterday, to improve their data. They orchestrate collaborative organizations. C-level executives — CEOs and heads of operations, IT, HR, marketing, and the like — are not often known for collaborating closely on initiatives involving technology. But these groups need to work together in AI-driven organizations to establish priorities, determine the implications for technology architectures and human skills, and assess the implications for key functions such as marketing and supply chain. If AI is viewed as an important catalytic technology, there is no reason why senior executives should not collaborate in its leadership even if the organization’s near-term plans for AI may be relatively modest — because they won’t be modest forever. Deloitte has referred to this approach as “symphonic leadership,” with players working in concert like an orchestra. Many companies that develop AI projects say they employ agile methods. In AI initiatives that benefit from agile methods, these executives must be involved stakeholders, providing input on goals and deliverables and the impact that the initiatives will have on the business. Together, agile and symphonic leadership teams will not only facilitate progress in AI, but communicate to the organization that a new way of working and managing is being adopted. Leaders will have to work harder to realize the benefits of AI. In most organizations today, AI is a source of evolutionary benefits, but we are confident that over the long run it will be a revolutionary force. AI will lead to changes in how work is done, how decisions are made, and how organizations harness knowledge and information to achieve goals. There should be little doubt that companies aspiring to be AI-driven need themselves to be led by leaders who are AI-driven — meaning motivated, knowledgeable, and engaged with regard to this powerful tool. 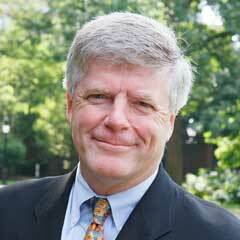 Thomas H. Davenport (@tdav) is the President’s Distinguished Professor of Information Technology and Management at Babson College in Wellesley, Massachusetts, as well as a fellow at the MIT Initiative on the Digital Economy and a senior adviser to Deloitte’s Analytics and Cognitive practice. Links to his work are online at tomdavenport.com. Janet Foutty (@janetfoutty) is chair and CEO of Deloitte Consulting LLP. When it comes to digital transformation, digital is not the answer. Transformation is.